My mom’s Nian Gao 年糕 glutinous rice cakes to usher in the new year and deviously designed to sweeten the lips of the kitchen god. 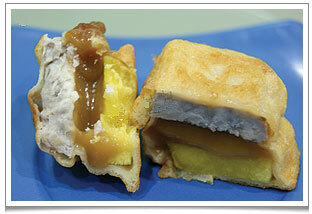 In this recipe, the nian gao pieces are sandwiched between slices of yam before coating in a batter and deep-fried. ‘Nian Gao‘ 年糕 (Chinese New Year cake) is a gorgeously glutinous yet health-conscious rice snack you can eat on its own or with freshly grated coconut. Or, at the cost of a few more calories, sandwich it (it’s about 1cm thick) between slices of yam or sweet potato. Or a slice of each! Dip the whole thing into a thin batter and deep fry to golden crunchy deliciousness! The stickiness of nian gao is for a very, very good reason. In a Chinese household, we believe that the good and bad deeds of each member of the family are recorded by the kitchen god ‘Zao Jun‘ 灶君. The kitchen of course is where all the juicy gossip happens. One week before Chinese New Year, Zao Jun travels to Heaven to report to the Jade Emperor and effectively spill the beans on everyone’s behaviour. Not wanting to take any chances, Chinese mothers see to it that the mouth of the kitchen god is sweetened and sealed shut with sticky nian gao just before he makes his trip. Below is the version my Mom makes every year. Being experienced as she is, Mom never measures out ingredients, and it almost never goes wrong. I’ve done my best to indicate quantities though, because I know most of us find that easier. But I do respect her way of cooking by feeling and having a connection to the food she is making. make the caramel by dissolving the sugar in a pan with the oil. When it gets to a dark, rich brown caramel. Turn off heat and leave to cool a little. Then add 3-4 tbsp water to form a syrup. Set aside. In a mixing bowl, mix the glutinous rice flour and water. Mix well so that there are no lumps. Add the caramel syrup to the mixture. Pour the mixture into oiled moulds; filling each mould till ¾ full. Steam on high heat for 30 mins. Carefully lift the lid and test whether the nian gao has set with a skewer. When the mixture has set, reduce heat to the lowest and steam for another 1½ hours. Lift the lid and carefully, wipe any water droplets that have fallen on the surface. Then turn on high heat for 1-2 mins without the lids to dry out the surface. Best to leave it till the next day for the flavour to mature. Oil your knife before cutting nian gao. Store in the fridge for a few months. Mom uses empty round tins, old luncheon meat tins, about 10cm diameter and 6cm deep. She has collected loads of these down the years. In my childhood she used to make enough nian gao for hordes of relations (they’d get a few shop-bought festive gifts too, by the way!) Nowadays she concentrates on making enough nian gao for offerings to the Buddhas in her home. 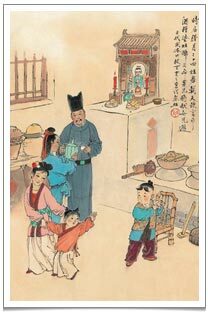 An old painting depicting household offering sweet teas and sweet cakes to the Kitchen God just before Chinese New Year. The nian gao I am referring to here should not be confused with the thin white pieces of glutinous dough that one can get in a Chinese grocery that are added to soups or stir-frys (I believe a similar Korean dish ‘Tukbokki’ uses chewy cylindrical rice pieces in a chilli base sauce). Commercially manufactured nian gao are a bit, dare I say, vulgar. They are shaped in all sorts of ‘lucky’ forms like gold ingots or swimming carps, but are full of artificial colourings and wrapped in plastic and definitely not very tasty. Mom insists on the natural, deep brown colour that comes from the caramel she adds to the batter. She makes the caramel herself according to a recipe she learned from my grandmother. She starts by dissolving sugar in vegetable oil and making a syrup when the caramel has cooled down. A tiny amount of caramel syrup goes a long way and as the nian gao matures, the colour gets deeper. If available on hand, my mom will line the oiled tin moulds with banana leaves which adds a wonderful aroma to the nian gao. One has to be careful not to leave any gaps in the banana leave lining or the nian gao batter will seep out to the tin. I think the nian gao are much prettier this way. 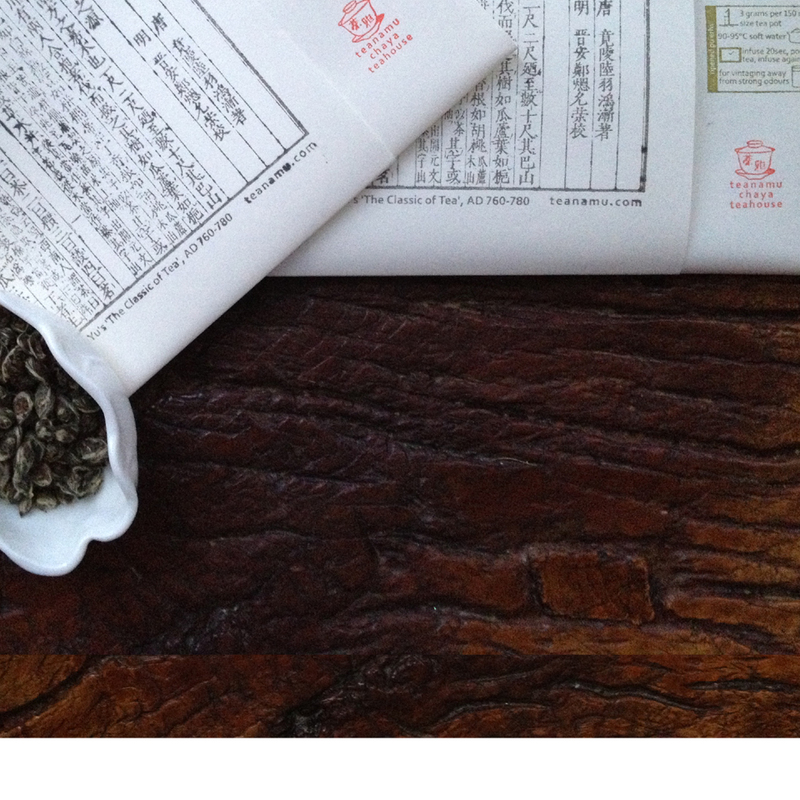 Taste nian gao at Chaya teahouse on 04 February! We recommend pairing it with relatively ‘high oxidised’ oolongs like Wuyi Shuixian or Heritage Tie Luo Han. Sweetening these with Chinese fruits, red dates, longan or goji, maybe a few slivers of ginger too, would work nicely too. Or perhaps a ripened Pu Erh, such as our Emperor Pu Erhs, lightly enhanced with a little floral touch, say chyrsanthemum or rose. Finally, a word on the meaning of ‘nian gao‘. ‘Nian‘ 年 means ‘year’ and ‘gao‘ 糕 means ‘cake’, so this is New Year Cake, pure and simple. But in Mandarin ‘gao‘ also sounds just like the word for ‘higher’, with the usual implication in Chinese families of ‘higher school grades’ or ‘higher up the career ladder’. Hence, the auspicious greeting, ‘Nian Nian Gao Sheng‘: ‘Increasing Prosperity Every Passing Year’. Nian nian gao sheng 年年高升, everybody!